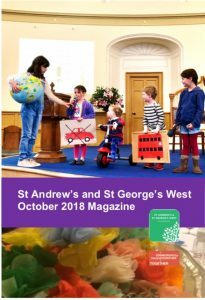 Our October magazine is out now! Meet Moira McDonald interim moderator for our vacancy, pastoral care leaders and guest preachers at some of our autumn services. Mary Davidson looks forward to the Christian Aid Art and Book Sale while Alison Campbell highlights Malawi’s first solar tree – and other innovative work at Mulanje Mission Hospital. Connect with nature this spectacular autumn season as Pat McKerrow reflects on a much loved animal and Tony Shepard shares a poem. And as the centenary of the WW1 armistice approaches, Alec Hope remembers James McPhieVC who was killed in action in the final weeks of the war. And Ian Gilmour bids thanks and farewell, remembering quietly extraordinary people who continue to inspire him. All this, and more, in the StAGW October 2018 magazine.